Thank you to Goodreads and Penguin Books for sending me the audiobook of I See You by Clare Mackintosh. 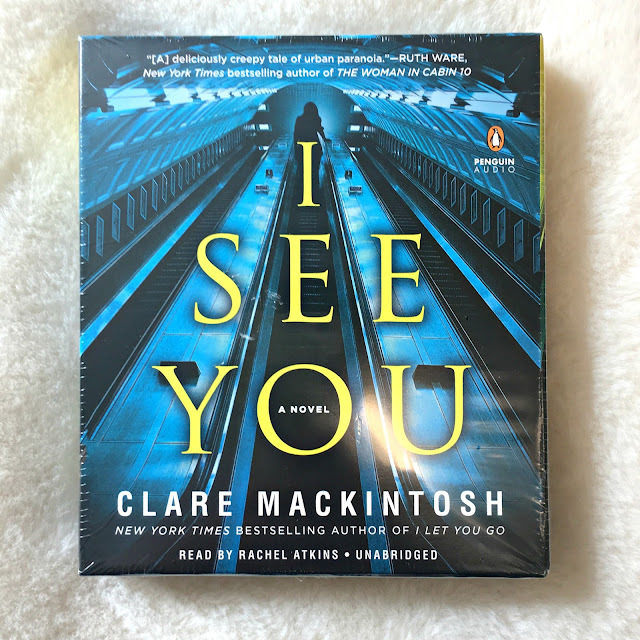 I See You is an edge-of-your-seat, page-turning psychological thriller from one of the most exciting and successful British debut talents of 2015." “How fast can you run? When you really have to? In heels and a work skirt, with your bag banging against your side: how fast? When you’re late for your train and you have to get home, and you race down the platform with seconds to spare: how fast can you run? What if it isn’t a train you’re running for, but your life? If you’re late home from work, and there’s no one in sight. If you haven’t charged your phone and no one knows where you are. If the footsteps behind you are getting closer, and you know, because you do it every day, that you’re on your own; that between the platform and the exit you won’t see another soul. If there’s breath on your neck, and the panic is rising, and it’s dark, and cold, and wet. If it’s just the two of you. Just you, and whoever’s behind you. How fast could you run then? It doesn’t matter how fast. Audiobook received from the publisher.